Given we are Queen fans here at the DiscoverTuscany office and love the Hard Rock Cafe in Florence, we could not share this upcoming event: “Freddie for a Day“! On Friday, September 5th on the occasion of Freddie Mercury’s birthday, the event is celebrated at all of the Hard Rock Cafes worldwide. The event not only commemorates the legendary artist and front man of Queen, but is also a day of fund-raising for the Mercury Phoenix Trust, a volunteer organization active throughout the world. Founded immediately after the death of Freddie, the organization raises funds for research and fight against AIDS. * From 5:45 to 7:15pm, you can enjoy a video projection of the new Queen DVD “Live At The Rainbow ‘74” while enjoying a special special appetizer menu. For just € 12.00, you get a Cocktail to choose from a list, a Nachopalooza and a pair of a Freddie mustache to wear ;-). Do make a note that if you book the appetizer menu, the table is reserved only until 7:15pm. * Starting at 10pm, there will be Live Music with a Tribute band, the Killer Queen. * You are encouraged to dress up as Freddie for the evening: a contest will judge the best costumes and prizes will be given! Throughout the day, you can make enjoy a special menu at the cost of €35.00 per person which includes either a pair of a Freddie mustache or one raffle ticket – all money raised goes directly to the Mercury Phoenix Trust. 10 lucky winners from the raffle will receive CDs and DVDs and other prizes offered by Universal Music Italia and by Hard Rock Cafe Firenze. We’re planning on stopping by next Friday and enjoying some drinks, nachos and music! 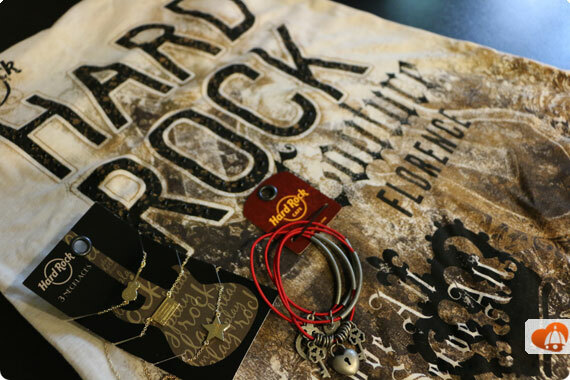 Join us, book your table now (or for any questions) by emailing florence_sales2@hardrock.com or calling +39 055.277.841. Finally, if you want a quick meal but delicious meal in the heart of Florence, taking a break from Italian cuisine, you can go eat at the Hard Rock Cafe and not wait in line with the option to buy a “skip-the-line” menu option here but if you want a special gift as well, make sure to print and take this coupon as well. If you want to enjoy live music, the Hard Rock Cafe has a local band every Friday evening starting at 10pm.